A 58-year-old man came to his family physician for evaluation of a lesion on his back. The man was a long-time patient of this physician. The patient denied prior skin problems on intake patient questionnaires at annual physicals in 2004, 2007, and April 2009. This visit occurred in September 2009. The physician found “a 2 cm annular café colored nevus over the midline of his back. There is a small area of darkening of the periphery.” The medical record said the patient claimed it had been present for a year, and had not changed, bled, or itched. The physician’s impression was “benign compound nevus.” The physician offered to remove the nevus, but the patient opted against removal. This offer and the patient’s declination were not noted in the medical record. The pathologist diagnosed Clark’s level three, 2.82 mm thick malignant melanoma with significant horizontal as well as vertical growth. The patient was referred to a general surgeon and underwent wide excision and lymph node mapping. A left lymph node was found to be positive for metastatic melanoma cells. Dissection of the left inguinal femoral nodes was done and followed with adjuvant IV interferon therapy. 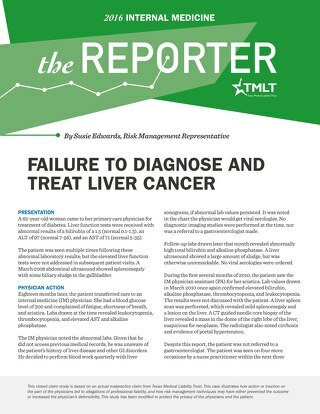 Current medical records from the patient’s oncologist reflect a 40% chance of survival. 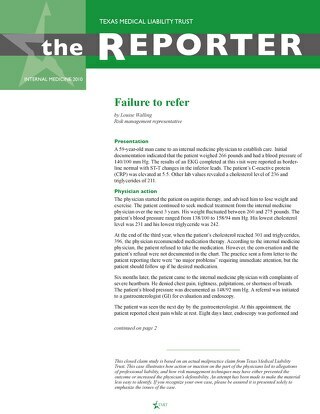 failure to timely refer to a specialist for evaluation of the lesion. Contrary to the medical record, the patient claimed he complained of the back lesion at the 2007 visit and the April 2009 visit. He also alleged that the family physician was negligent for not excising the lesion at the September 2009 visit. It was further alleged that diagnosis and treatment of the lesion on either the April or September 2009 visits could have prevented metastasis and resulted in an improved five-year survival rate. One of the main issues in this case was the discrepancy between the patient and the physician regarding the April 2009 visit. 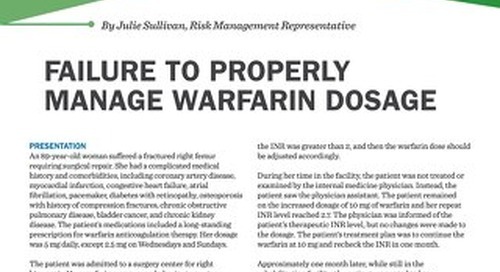 The physician’s medical records for this visit were extremely meticulous, including a detailed patient questionnaire and a full two-page narrative review mailed to the patient with a letter containing recommendations on managing his other medical problems. The patient also did not indicate skin problems on the patient questionnaire for this visit. It was hard to believe that despite his copious records, the physician failed to chart a skin lesion complaint in April 2009. Of particular concern in this case was the physician’s diagnosis of the lesion in September 2009. The physician testified that he thought the lesion was benign. 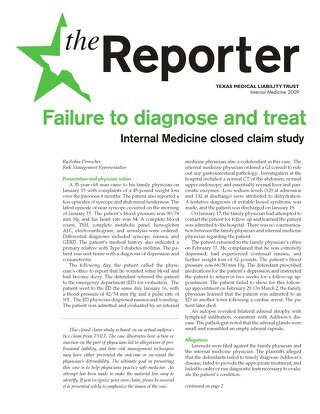 However, most expert consultants believed that the lesion was malignant at that visit, based on the description of the lesion in the patient’s medical record. The patient deferred removal of the lesion with the physician’s approval. The plaintiff’s experts argued that the failure to refer the patient to a dermatologist or to perform a biopsy in April or September demonstrated he had insufficient knowledge of melanoma. The physician did not document that he offered to remove the lesion in September 2009. Such a note would have been helpful to the defense of this case. Defense experts were supportive of the physician’s decision not to remove a lesion he felt was clinically insignificant. Clinical recognition of skin cancer, including melanoma, is difficult, not precise, and it is uncommon in general practice. However, there was criticism of the family physician’s inconsistent descriptions of the lesions in September 2009 and December 2009. It was believed this would strengthen the plaintiff’s argument that the patient should have been referred to a dermatologist. This case came down to an alleged delay in diagnosis of three months. 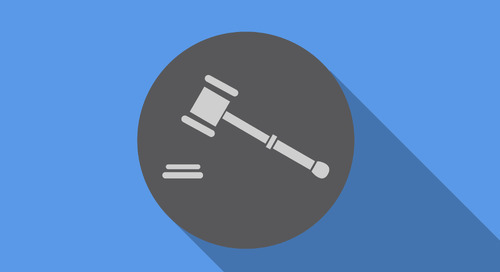 Although it is unlikely that a 3-month delay caused any significant change in the outcome or treatment of the patient’s melanoma, it has become increasingly difficult to get a jury to focus on this in cancer cases. This case settled before trial with the physician’s consent. The expert support for the plaintiff, the distinct polarity in the memory of the physician and the patient, and the sympathetic nature of the damages were major factors in the decision to settle. 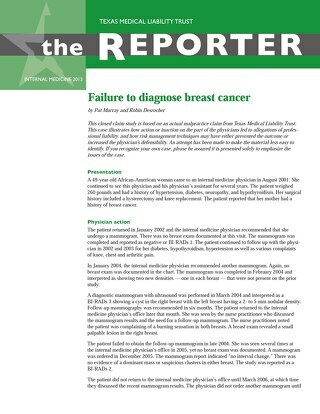 Allegations of failure to diagnose and treat in a timely manner are increasing, particularly with diagnoses of cancer. Several processes associated with prudent risk management can be identified in this claim. 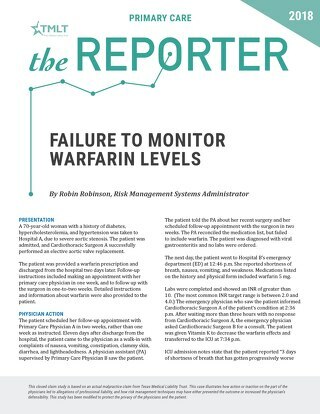 Documenting patient care and decision-making is necessary for excellent records, as well as the opportunity to defend a physician. It is dangerous to rely on memory. Missing or incomplete documentation creates a sympathetic bias toward the patient at a jury trial. This physician did not document his offer to remove the lesion earlier or the patient’s refusal. 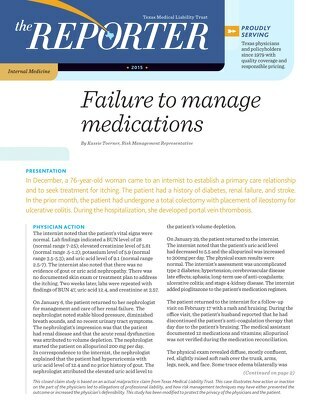 Just as informed consent is required for the performance of procedures, acknowledgment of informed refusal of treatment should also be a routine part of physician practice and documentation. Retrospective review of any case provides an unfair advantage for the reviewer. Neither plaintiff nor defendant physician consultants disputed the difficulty in the clinical recognition of melanoma. Primary care physicians face a multitude of complex patient conditions, and knowing when to refer is a key component of their practice. Early referral to a dermatologist might have made a difference in the diagnosis and treatment of this patient’s melanoma. 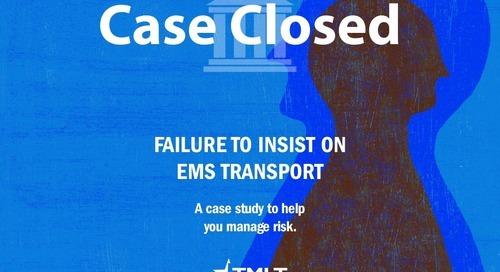 These closed claim studies are based on an actual malpractice claims from TMLT. 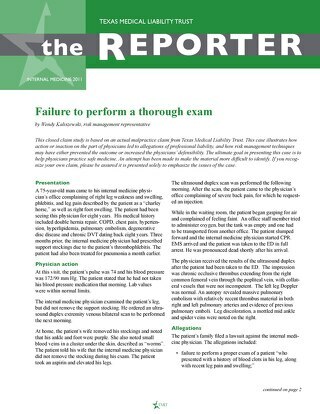 These cases illustrates how action or inaction on the part of physicians led to allegations of professional liability, and how risk management techniques may have either prevented the outcome or increased the physician’s defensibility. These studies have been modified to protect the privacy of the physicians and patients. At 8:30 a.m., a patient’s wife called her husband’s family physician and requested an appointment because her husband was experiencing chest pain that began the previous evening. A 49-year-old African-American woman came to an internal medicine physician in August 2001. She continued to see this physician and his physician’s assistant for several years. A 44-year-old man came to the ED with swelling of the lower extremities and ecchymosis present for the past six days. He denied nausea, vomiting, or diarrhea. On December 3, a 27-year-old woman came to the office of Internist A. 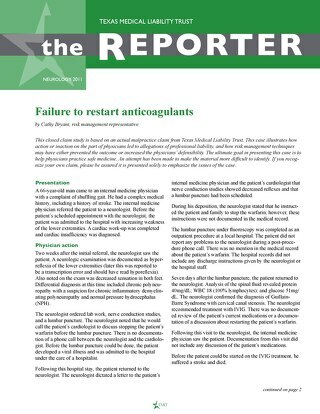 The patient reported abdominal pain. 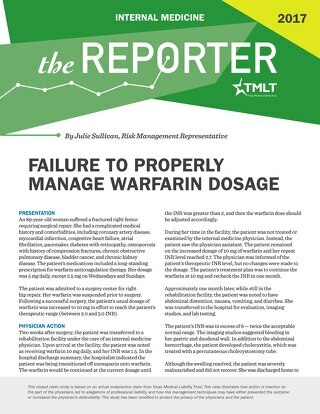 This is an actual TMLT medical malpractice case, involving the treatment of a patient with chest pain. 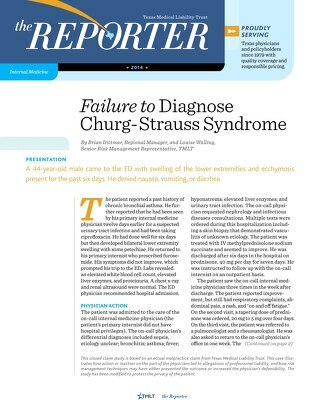 Case study and current research on the prevalence of diagnostic errors, common causes, and ways to prevent these types of errors.